East Midland was an early user of the Bristol RE/ECW combination once they became generally available. This example is seen in Bawtry on 13 July 1968 when it was about three months old. The rich red livery really suits the vehicle whilst the vertically mounted twin headlamps give a touch of class. How could NBC impose the lacklustre poppy red and leaf green schemes? East Midland even had to change to being a green fleet post 1972. Note the lack of sliding or hopper windows, in common with other BET Companies at this time ventilation is provided by three lift up ventilators in the roof. The only discordant note is the early style shallow windscreens which must have been a real problem to taller drivers. These were among the first non-Tilling RE’s that I saw and I remember being very excited at the prospect of Bristols becoming more common, perhaps even in the Manchester area; this did indeed happen, and for a while I was able to travel to work on North Western RE’s. I drove two or three of Crosville’s "shallow windscreen" RE’s, and beyond the excitement of driving an RE (we were the only Welsh Crosville Depot with no RE buses) I found that the low windscreen top added interest; the top of the windscreen was always in my peripheral vision, but not enough to cause a problem. Everyone praises REs. When I was in Widnes and working in a school garden. We had greenhouses about 50 yards from the road. Every hour a Crossville RE would come past and the greenhouses didn’t half rattle from the exhaust noise of these buses! And they wondered why passengers deserted public transport for cars, David! Nice town, Chesterfield. When TBAT broke up in 1942, certain firms "switched" allegiance. [NBC and BLMC strong arm tactics were nothing new.] 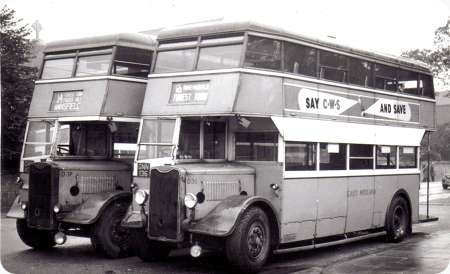 Cumberland, United and Lincolnshire were Leyland operators. North Western was a Bristol operator and went from Tilling to BET. It was natural for North Western to take to Bristols with alacrity when they became available in 1965. I do not know the provenance of East Midland, but pre-war they were a Bristol operator and so their renewed allegiance to Bristol should not have come as a surprise. [Their roots were in the local independent, Underwood.] The big surprise – to Leyland Motor Corporation as well – was how readily Ribble and Southdown both took to Bristols. In all the above cases, it was both the RELL and the RELH which were the major swing factors. Having re-read my last post, it occurred to me that the bulk of RE buses operated by North Western, Ribble and Southdown were actually RESL – both RESL6G and RESL6L. I agree with earlier comments regarding the tasteful shade of red used in this era of East Midland operation. I never did like the corporate NBC colours, especially that awful green, and can only guess how good these would have looked in the EM chocolate, cream and biscuit livery! I spent some time in the old county of Huntingdonshire and frequently travelled between Huntingdon and Saint Ives on United Counties. Often my carriage would be TBD 280G, a dual-purpose RELH6G, new in 1969. This was a most comfortable bus to ride and was in the much better reversed livery of cream and green. Happy days. Here we go again on the subject of livery, who did have the best? Personal taste and where you grew up would have the most influence on your answer. United’s reverse DP livery looked good on most of the single deck fleet, but, although I cant remember any being done this way, I don’t think it would have transferred to double deckers. OK Motor services always looked smart, but probably too time consuming to be practical for a large fleet? For smart plain and simple, you would go a long way to find better examples than Sheffield or Darlington, Midland Red, on the other hand, was in most cases too plain and simple, but few would argue that the all one colour of Glenton was drab or ugly. Bright colours or subdued? The orange and yellow of Yelloway was bright and cheerful, but the black, white and grey of Woods of Blackpool ’Seagull Coaches’ or the olive green and cream coaches of United were to my mind a classic. Its a question without answer, but it produces some good comments. Right now? I’d give anything to go back to the days of NBC/PTE corporate liveries – there was more variety about then than there is now . . . and at least tickets weren’t standardised under NBC. I’ve just finished under-coating the cloak-room wainscot/door, in preparation for a deep blue gloss, and I’ve been struck by the similarity in colour/finish between my undercoat and First’s new livery – OK, I’ll give First a couple of weeks before their colours dull to a matt-like finish. And we don’t even have "proper" local fleet-names anymore, and many of the local-authority operators have disappeared. Anyway, back to the picture . . . wasn’t EMMS red a shade called "BET red", and common with other companies(?) in the group? I don’t think that there was a ‘BET’ shade of red. East Midland used a deeper, more maroon shade than nearby Trent, PMT and North Western all of whom seemed to use a slightly different shade of brighter red. EMMS red was closer to Ribble than any other BET red. It was stated emphatically that neither was maroon. As Ian says, none of the other three were an identical shade of red. That was the beauty of BET liveries – and of course SUT was unique. In fact the whole set up was unique – and certainly pretty special – since SUT was equally owned by EMMS, Tracky and NWRCC but neither followed the vehicle purchasing nor the operating practises of any of its owners. W. T. Underwood was far from being a local independent operator. It was an offshoot of United Automobile Services of Lowestoft. The manager of U.A.S. Mr. E. B. Hutchinson sent one of his ‘bright young men’ W. T. Underwood to Clowne in North Derbyshire in 1920 to establish bus services in the area. The vehicles were supplied from Lowestoft in the United livery of that time of chrome yellow and brown, later separated with a cream band. The United fleet name was covered over with a board bearing the name of Underwood in the same style. In 1927 the company was re-named East Midland Motor Services Limited. At this time W. T. Underwood left the company to pursue other interests. Although United A. S. changed their livery to red around 1930, East Midland retained the old yellow brown and cream livery until 1955. East Midland were under Tilling Group Control until 1942 when control passed to B. E. T.
I wasn’t surprised at BET companies buying Bristol REs as soon as they were available, simply because by that time all the alternative rear-engined single deckers already had questionable reputations, whereas the RE had been giving trouble-free service to Tilling Group operators since before any of them was invented. Unfortunately I wasn’t so keen on RE buses as many enthusiasts, as I’ve never thought much of the interior finish of ECW bus bodies, and I was never in the right place at the right time to sample anything else. Not having to operate or drive them, I much preferred the Leyland Panther. Coaches of course were a different matter. But Peter, you can’t blame Bristol for the ECW body! Even under common National ownership they were never the same company. Although having a big soft spot for the late lamented RE in general, my favourites to ride on were always the Series I, and early Series II models with the shallower windscreen. The RE was designed from the outset with air suspension, which gave a very smooth ride. However, the system did have a few problems relating to short airbag life, especially on stage carriage vehicles, and as a result many operators converted their airbags to coil springs. This fairly straightforward conversion still endowed the RE with a nice ride, but around 1969/70 Bristol’s new masters Leyland decided that the air/coil suspension system would become an optional extra, and that the standard RE would now have traditional leaf springs. Although it could be argued that this simplified the design from an engineering point of view, the result was a rougher-riding RE, which now rattled and banged over uneven road surfaces. This backward step was also said to be the cause of problems relating to increased vibration, movement and cracking around the drop-frame at the front of the chassis. On the ECW bus bodies this led to front domes cracking or working loose, and problems with the flooring and step at the front entrance. The newly introduced BET windscreens also seemed more prone to cracking – surely not a coincidence, as the BET Group had been using the screens successfully for years. Despite these shortcomings, the RE still remained a dependable ‘engineers bus’ to the end, with major units logically laid out for ease of maintenance, repair or removal. There were plans for a Series III RE, which would probably have had improved ‘second generation’ air suspension, and options of more powerful engines. However, as we all know, Leyland had other ideas, and scrapped the RE to give its new integral National a clear field. During the 70s I drove for Royal Blue based at Victoria coach station London. I have fond memories of my time there and in particular driving Bristol REs ECW bodied. I preferred the manual gearbox which could be hard work at times especially on the long routes London to Plymouth or Penzance, the semi automatics did reduce the work load but I felt that I had more control with the manual. I dove most of the routes over the West country and into Dorset, I recall lining up for the tight turn into the down ramp which was Bournemouth coach station. In the later years Leyland joined the fleet with Plaxton bodies but I still preferred the REs in my opinion the finest coach ever to be built. I still think back and recall all my colleagues and I still have copies of the timetable and drivers handbook with route directions which I cherish with much love. EMMS red was ‘BET Dark Red’ and was the same shade as City of Oxford MS, Northern General and Yorkshire Woollen District. Due to differing paint suppliers the actual shade could vary slightly, even on buses within the same fleet. Trent, Yorkshire Traction, North Western all used ‘BET Light Red’, again for the above reasons the actual shade could vary slightly. Midland Red and Ribble both had individual colours not within the BET colour catalogue and referred to by the company name, ie, ‘Ribble Red’. If you look at the livery style of East Midland Bristol VR’s that were delivered at the same time you will notice it looks more a Mansfield District style only in red. A company they were about to take over under NBC. Even after privatisation they stayed green. At first glance, this pair are identical, but not so. See the differing sizes, and positioning, of the headlamps, and also the deeper edge of the canopy on D37 (far Vehicle). These were delivered in 1945, then rebodied by Roe in 1954. I cannot be certain, but think that the seating capacity was L27/28R, both before and after. See also the paper stickers inside the lower saloon, perhaps telling of timetable changes, or advertising EMMS’ other services, sometimes advertising for drivers/conductors. Incredible, Les. Never seen these in original guise but have seen the rebodies. As usual, the new bodies were beautiful and beautifully made – but interestingly, they were quoted as being 26′ 9" long. [Was this done simply by building the body longer, or was the chassis extended?] Roe rebuilt literally hundreds of war-time Guys and Daimlers but the sad thing is that few, if any, lasted more than ten years with their new bodies. East Midland, Tracky, County and Woolen spring readily to mind as do the, penny numbers of AECs and Daimlers for Sheffield A fleet. and of course, Sheffield Guy 45 David, rebuilt by Roe for the B fleet. During the war official dispensation was given for the current 26ft. length limit for two-axle double deckers to be increased to 26ft. 9in. in the case of Guy Arabs, in order for the optional long Gardner 6LW engine to be fitted, by allowing it to project forwards in a ‘snout’ rather than have to move the front bulkhead back. As it happened, the majority of Arab II’s continued to be fitted with the shorter 5LW, but the elongated bonnet was used irrespective of which engine was fitted. All East Midland’s Arabs had the 5LW, so there would probably have been a lot of spare space behind those radiators. They would be Arab I’s, but were they 5LW’s or 6LW’s? And Roe’s part in building austerity bus bodies was something I’d only recently discovered. Few of them ever seem to have made their way south of the Midlands. I certainly never saw one and it’s very much a recent discovery that they built any. Duple, Brush and Massey seemed the dominant builders and their quality was in that order, too, I’d hazard. East Midland took only twelve utilities during the war. The first, in 1941, was a Bristol K5G which went to North Western in 1946 in exchange for an Arab I/Roe. Next came two Arab I’s with Brush bodies, the remainder were all Arab II’s with Roe bodies. Interestingly, East Midland managed to obtain consecutive last numbers for the registrations throughout the war. Five of the Arab II’s received new Roe lowbridge bodies in 1954. There was a further Arab II which was taken over from Baker Brothers of Warsop in 1953 and also rebodied by Roe. All of them went in 1960 and six years does seem a sadly short life for a vehicle with a new body but of course the Atlantean was no doubt responsible for that. The question of the wartime length dispensation for the Guy Arab is an interesting one, production continued after the war with the Arab II, then the Arab III, all built to the extended length before the maximum dimension was increased to 27ft. So if it was an emergency wartime measure, how come the dispensation was never rescinded after the war, was it quietly forgotten about? It’s surprising someone didn’t ask, if Bristol and Daimler can accommodate the Gardner 6LW, why can’t Guy! "[the first] 500 were known as the Arab MkI. Thereafter the Arab MkII was introduced, and all had the longer bonnet and outswept front mudguards which had featured only on the 6LW-engined MkI examples". On that basis, if they are definitely MkI chassis, they must have had 6LW engines. If as John Stringer states all the East Midland Arabs had 5LW, then these are MkIIs. Caerphilly had at least one Roe utility ArabII, which survived as training bus until at least 1966. It has curved valances to the canopy and platform rather than the straight ones on the EM view, but this could have been a subsequent modification. BBF records it as rebuilt 1957, but the only obvious difference is that the front top deck windows are rubber-mounted, and there are two sliding windows per side on the lower and three on the upper deck. Chris… If you check Peter Gould’s lists, it was Doncaster’s wartime Roe bodied Regents that seemed to survive longest- Does anyone know why? Joe At least three of the Doncaster Regents were to full peacetime standards being delivered in 1941 all of the Roe bus output for that year were to the same pre war spec. It is possible that the 1942 Doncaster Regent was also built to this standard using sored parts. Certainly Roe produced a full utility body by January 1942 albeit on so called unfrozen chassis for Yorkshire Woollen and Yorkshire Traction. 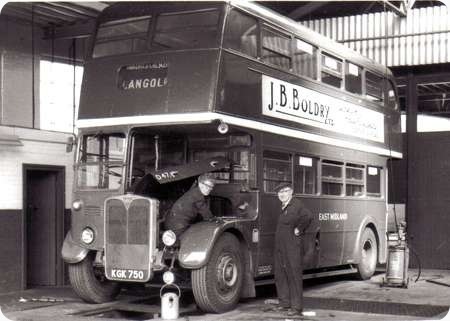 As well as building utility bodies on Guy and Daimler chassis they also built a number of trolleybuses building 63 of the 438 buses produced. 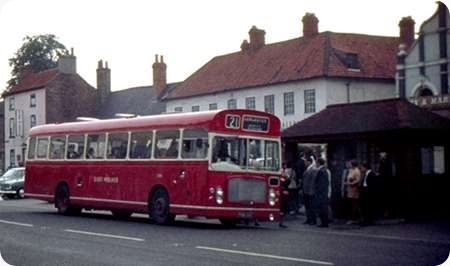 East Midland Motor Services took over Baker Brothers in Warsop who run the Mansfield to Church Warsop service I am not sure if it went to Shirebrooke the garage was at the side of the Hare & Hounds pub, the relief road in Warsop as gone through the garage. They took over Trumans at Shirebrooke and built a larger garage which is now a furniture shop. New Street, Chesterfield, is car body repairs rather than car sales, although Stagecoach East Midlands retained offices there for quite a while after the buses had moved out. I have seen photos of East Midland’s Albion Lowlanders in two liveries, red with a cream waistband and red with cream lower deck window surrounds. Can someone enlighten me on when these versions were in use? Tim asked about the colour schemes of EM’s Lowlanders. I am not able to recall the timescales but can tell him that they were delivered in the maroon colour with a broad white band above the lower-deck windows.The fronts as I recall were unrelieved maroon. They also went through a period wearing what I think was the NBC leaf-green and white as well as the two red/cream options as described by Tim. After Tim’s question about East Midland’s Lowlanders appeared under this heading I checked my picture collection but sadly do not have any of this subject, however Classic Bus No63 carried a four-page article all about them and in which there is a section headed ‘Transformations’ of which the following is an extract "Over the years, East Midland’s Lowlanders were subject to several transformations of their appearance. They entered service in the company’s dark red with single cream band…" and goes on to say that changes were made to include cream window surrounds and later still their appearance in NBC green was in 1973. The article contains five pictures though none showing the period with the greater use of cream relief. Despite the piece saying they entered service with a bold cream band, my own memory is of a white, not cream band. It could be my old grey cells playing tricks but I frequently travelled on these on East Midland’s route 3. Thanks, Les. Most helpful and interesting. Tim.